Tear Your Eyes Away From Cookies And Look At This! Snack Girl has been hard at work determining how many cookies she will be making this weekend. I started dreaming with five different cookie recipes. My partner wondered aloud, “How are you going to have time to do THAT?”. Yes, good question. I am down to three different Christmas cookies and, no, I’m not going to tell you what they are. What I am going to tell you is to EAT BEETS. This is the season of beets and carrots and they are very inexpensive. My local beet store was charging a mere 50 cents per pound for beets. Here I have created yet another holiday salad that looks, well, festive. 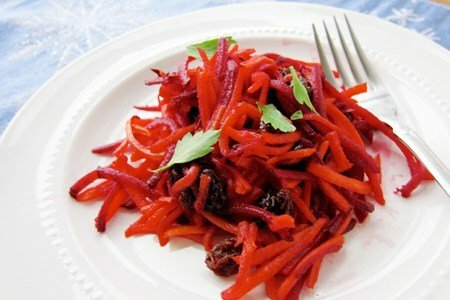 Red with a splash of green, this grated carrot and beet salad would go great on the side of roasted meat (like lamb). I peeled both the beet and the carrot and then used the grater attachment on my food processor to grate these fast. This is best after it marinates for an hour or longer so make it ahead for the big meal. I am agnostic about the raisins. Personally, I don’t like raisins in my salads, but they are nice here. You don’t need them to make the salad work. This salad is very crunchy and filled with flavor. You won't even notice that you didn't add olive oil to make the dressing. No kidding. Do you eat beets during beet season? Please share. Place carrot, beets, raisins, cumin, and cinnamon in a medium bowl. Squeeze lemon onto mixture and add honey. Mix until combined and taste. Leave in refrigerator to marinate for an hour (if you have the time). Looking For Red and Green? Try This! All I can say is I made my last batch of cookies last night, I am officially done for the season!! I don't need all those calories! Love the looks of the salad, but I'm not a beet person! :( Have a great day!! You just reminded me I have beets in the refrigerator. Guess what I'm making. Looks good. Look at the beautiful colours of the recipe! Looks delicious! I do not even care for beets.....but I KNOW that I am going to love this! I cannot wait to pass this along to all of my senior (non computer) friends, this will make their day. Thank you so much! This looks great. Thanks so much for these healthy recipes. I'm always looking for different items to toss into a salad. I will be adding beets and the carrots into my next creation! I tried beets for the first time this year. Looks like I have another reason to try them again. Thank you for the recipe.. I love beets and will make this tonite.. The beet goes on! I love them and will enjoy beets as much as possible this Christmas. Easier to live with than over indulging in cookies. I didn't grow up with beets, so the flavor to me is still foreign - so earthy. I did get some Chioggia beets in my CSA box last year. They were beautiful! I thinly sliced them, tossed them with olive oil and kosher salt and sauteed them on the grill. They were delicious! Although I've tried to replicate that since and haven't come close! I LOVE beets--& carrots! I could do without the raisins, but I don't really dislike them. I already have a couple of kinds of beet seeds ready to plant in the spring. I can't focus on making Christmas cookies because all I'm doing is dreaming about gardening in the spring! I LOVE BEETS!!! I don't know why, but I always have since I first tried them. Ironically, I have only made them myself once. They're messy. I love beets. Pickled, roasted, grated, etc. I have been eating them a lot this year. I like them baked with a bit of olive oil and rosemary. Love beets! Snack Girl, you didn't cook the beets before you grated them, did you? Would love to try this recipe but will have to break down and get a food processor. Grating beets by hand would be a real mess. snackgirl you are a lifesaver. That is all.